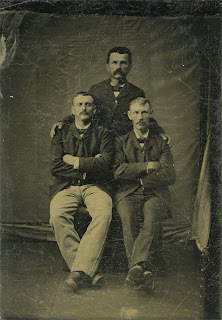 The win, place and show resultants from the Mid-Atlantic Inventors Fair and Mustache Cultivation Championships of 1871. While history lauds the Inventors Fair's Norris Benderstaff and his breakthrough discovery of mica-laced tooth powders, little is known of the Champion Mustache Cultivators. Due to the long tradition and unwavering intricacies of mustache competitions, we do know that the winner stands, the runner-up sits at his right hand, and The Mustache Genteelity prizewinner at his left. But all the rest, even these gentleman's names, has been lost to the restless combs of history. It only gets better. LOL.